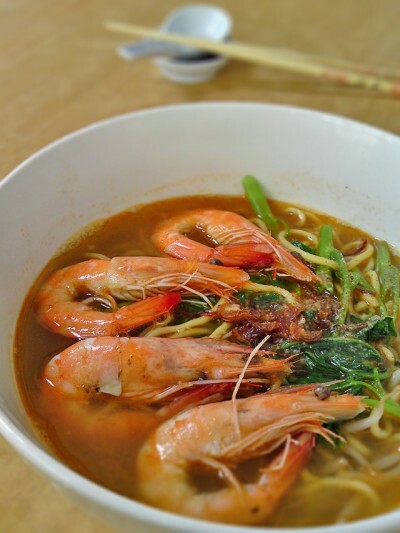 Home / Chinese Cuisine / Lam’s Prawn Noodles – If You Relish A Proper Old School Prawn Soup! No where in Singapore has more Big Prawn Noodle stalls than at Jalan Besar area. Around that area, it is like, every few streets, you will come across one stall and they all are positioned strategically from the Beach Road to North Bridge Road to Jalan Besar Road to Race Course Road to as north as Cambridge Road. All in all, there must have, at the very least, 10 stalls no less. To the prawn noodles aficionado, I guess they know where to go for a good fix around that area but unfortunately for me, I’m still waiting for the elusive one to beckon. I guess if I’m willing to pay $8 or $10, many stalls can provide me with a good fix but honestly speaking for $10, the bar then has to be raised right? The real good ones are not just those that can give me a king prawn just because I paid $10 for it but able to hit all the shiok points for me outstandingly. So far I have found none able to do that and of course I am more keen to discover one that doesn’t require me to part $10. So when I was told about this good hae mee(prawn noodles) stall called Lam’s Prawn Noodles which has a purportedly long history, I can’t resist not checking them out and see how much the prawn noodles there can thrill me. 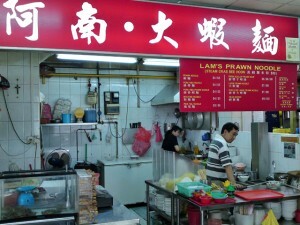 Lam’s Prawn Noodle has many different types of prawn noodles combination with ingredients like ribs, intestines, pig’s tail, scallop and even crab. The cheapest bowl of prawn noodles here will set you back $4 while other combination like large prawns, scallop or crab will cost you between $7 to $12. My $4 bowl came with 4 fresh mid-sized prawns but they are not the tiger prawns or banana prawns. It tasted like one of those you can buy for $7/kilo from any seafood stall in the market so it was slightly disappointing there. The soup however was quite shiok. It didn’t have that hae bee(dried shrimp) flavour overdrive which is the case with several other big prawn noodles I’ve eaten. If you relish the pure prawn flavour in the hae mee soup then this might be what you’re looking for. Conclusion: I guess this should be considered relatively affordable at $4 with 4 middle sized head-on prawns in quite shiok soup. The score however just stopped at good and a bit more to go to be great. The soup is old school kind which is what I liked.